NASA's twin Grail spacecraft inside the Delta 2 rocket stand ready to launch on September 8, 2011, from Cape Canaveral, Florida, on their mission to study the moon..
NASA has postponed the launch of two moon gravity mapping spacecraft to no earlier than Saturday (Sept. 10) — the second delay in two days — to give engineers time to investigate a potential glitch with the rocket that will carry the probes into space. The Grail mission (short for Gravity Recovery And Interior Laboratory) was originally slated to blast off on an unmanned Delta 2 rocket on Thursday (Sept. 8), but strong winds forced the NASA to stand down for the day. The agency hoped to make another liftoff attempt on Friday (Sept. 9), but an issue with the rocket's propulsion system was detected while the Delta 2 rocket was drained of fuel after Thursday's scrubbed launch, agency officials said in a statement. The twin Grail spacecraft are slated to launch Saturday at 8:29 a.m. EDT (1229 GMT) from the Cape Canaveral Air Force Station in Florida. 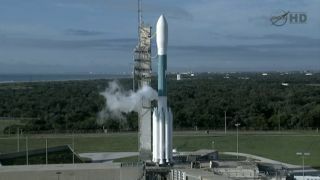 A second opportunity will also be available at 9:08 a.m. EDT (1308 GMT), if needed. The $496 million Grail mission will study the interior of the moon and construct accurate and detailed maps of its gravity field. Observations from the three-month mission are expected to help scientists better understand the origin of the moon, its composition, and its evolutionary history.